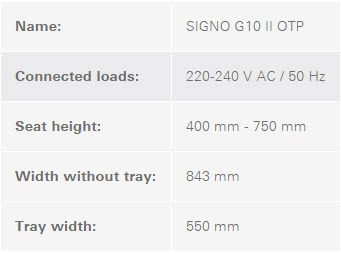 The fundamental concept of the SIGNO G10 II OTP is greater freedom – without dispensing with absolute safety. Standard high-quality technology by Morita combines with innovative functions to offer you outstanding results. A high degree of comfort, flexibility, and a sophisticated hygiene design ensure a comfortable environment for you and your patients. The model with over-the-patient delivery is extremely variable. So, for example, the five-jointed swing arm has a very wide swivel range, which allows you to position the operator’s element freely. The operator panel on the operator´s element allows you to control the patient chair and instrument functions with the push of a button. The easy-to-understand symbols and LED display keep you in control at all times and show all instrument parameters: quick and easy selection of instrument speed, direction of rotation, scaler intensity, instrument spray, and brightness of instrument lighting. As an alternative to the quick-operation buttons on the operator panel, you can control the patient chair and instrument functions conveniently and hygienically with the foot control. Your hands remain free – so you can concentrate totally on the treatment. Its stability, slip-resistance, and the ergonomically arranged controls make the foot control an integral part of your workstation – and not just for standard functions. The SIGNO G10 II OTP is equipped as standard with a single LED LunaVue ES OP light. The LED light emits minimal heat and consumes very little power. Twelve powerful LEDs in the optional LunaVue ELII provide even better lighting conditions and a broad and evenly illuminated treatment field – with a light output up to 30,000 lux. In both versions the light can be flexibly and safely positioned with five swivel joints. The five-jointed swing arm is equipped with a spring-supported height adjustment mechanism that allows you to adjust the operator panel to any desired position for treatment. Because the arm has an extremely wide swivel range, the operator´s element can be positioned exactly as required. Because the arm has an extremely wide swivel range, the operator´s element can be positioned exactly as required. And it easily swivels throughout a wide range so you always have what you need in easy reach – ensuring ergonomic access to all your instruments in every treatment position. The SIGNO G10 II OTP lets you and your team remain in a relaxed position, even when you’re treating a patient alone. The SIGNO G10 II OTP has a wide and flexible range of instruments: multifunctional syringe (pen type), one or two turbines with light, one Torx TR-91 micro motor with LED, and an ultrasonic scaler. The assistant´s element integrates practical operator panels for adjusting the patient chair and the cuspidor. The tray can be positioned as needed and enables an upright sitting posture for the assistant that prevents bending of the back. Everything within reach with the flexible pivoting arm of the assistant´s element. It provides the assistant with optimal access to all instruments. The extendable arm also makes it easy for you as the practitioner to work alone in an ergonomically comfortable position. The FreeAction additional tray offers extra storage space and can be easily adjusted for all treatment scenarios. Freely pivoting and ceiling-mounted, you can easily position the tray as needed. Both the dentist’s and assistant’s operating stools in the SIGNO G10 II OTPunit meet all requirements for a healthy and upright posture. Both chairs can be rotated 360°, and they are equipped with five stable casters and a backrest that ensures an upright posture. The armrests on the OS-LNII operating stools provide support during long preparations. An optimal seat height can be easily, conveniently, and hygienically adjusted with the large foot ring. The height of the OS-N assistant's chair can be adjusted with a hand-operated knob. The objective is to make their visit to the dentist as comfortable as possible for your patients. It starts with easy access into and out of the treatment unit and continues with a comfortable adjustable position for the patient. You are supported by the versatile adjustment options of the SIGNO G10 II and the elegant, minimalist design of the workstation also helps induce a relaxed environment. The hydraulic drive moves your patients into the required position easily and without perceptible start and stop movements, and ensures that even older and anesthetized patients stay comfortable during treatment. This allows you to focus on your treatment field. And once the OP light has been aligned to the work area, it automatically adjusts every time the patient chair is adjusted. With its flexible height adjustment, the SIGNO G10 II allows the patient chair to be adjusted to very low positions. This feature simplifies the first steps toward successful dental treatment for your small patients or patients with restricted range of movement. With its ergonomic contour, the upholstery on the backrest is comfortable for the patient and also gives you the best possible access to them. The comfortable upholstery in the sitting area helps patients relax. The material of the upholstery has a pleasant, moistureregulating surface and is available in two texture qualities. Its modern colors also add to the relaxed atmosphere of your office. Good communication inspires trust – which is a good basis for a sustainable dentist-patient relationship. The SIGNO G10 II OTP offers functions and additional equipment that allow you to demonstrate diagnostic results and treatment stages in a simple and easy-to-understand manner that ensures the best possible communication and consultation with your patients. The foldaway mirror can be used to show patients the condition of their teeth. This helps you explain all the required measures before or during treatment. The foldaway mirror can be used to show patients the condition of their teeth. This helps you explain all the required measures before or during treatment. The operator´s element has a USB port for a wide range of multimedia applications. For example, you can use it to attach an intraoral camera, mouse, or mobile device. There can be no compromise on hygiene – which is why the comprehensive hygiene concept of the SIGNO G10 II OTP uses components designed for hygiene from the ground up. The design makes it easy for you and your team to maintain high standards of hygiene safely in a minimum amount of time – for efficient processes and simplified workflows in your practice. The smooth, hygienic surfaces are easy to clean and the handles are easy to remove, and of course they can be thermally disinfected or sterilized. The flushing system of the SIGNO G10 II OTP is designed for the simple and reliable daily flushing of instrument hoses that supply water, and is another contribution to hygienic and efficient practice processes. Hands remain free, and you can set the most important instrument parameters and patient chair function with the foot control – you can even switch the OP light on and off. The result: improved hygiene during all steps of treatment. The transparent cuspidor is made of robust glass. It can be removed and disinfected easily. The surfaces are smooth and hygienic because they can be cleaned easily. Alternatively, you can choose a ceramic cuspidor. Its special surface coating repels bacteria and is very hygienic. Easy access is essential for effective preparation, cleaning, and care – including use of the vacuum filter and siphon. With Soaric, we have taken a step beyond developments as they are known today and offer you unique possibilities that will provide you with valuable support for your everyday dental practice and future challenges. The modern and timeless design of Soaric, evident right down to the finest detail, underlines your competence and professionalism. At the same time, however, it also creates an atmosphere of trust and safety. This is achieved by the treatment unit‘s reduced and harmonious expression of form. After all, the more relaxed the patient, the more pleasant the treatment.